Today's Spotify event, billed as "Discover what's next," is not so subtly supposed to be about how Spotify is going to one up its competition by helping you find music better than anyone else. The service is adding a new "Discover" and "Follow" tabs to its player that not only gives you recommendations, but also better context for what you're about to listen to and why its being recommended. The features will roll out in the new year. 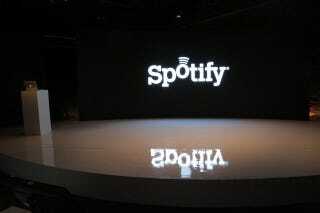 The problem as CEO Daniel Ek, puts it, is that Spotify is great when you know what it is you want to listen to. But what are you supposed to do when you don't know what you want. Spotify has already tried a number of ways of getting this done (social, apps, radio). Ek demoed the Discover tab in the Spotify web player that's been in Beta (it'll launch early next year). The tab give you recommendations much like other services might but also gives you contextual information like editorial reviews. The idea is to make discovery more sophisticated than browsing a list of artist and song names. The Follow tab is an upgrade to Spotify's existing system for following what other users are up to on the service. Until now, the system for following other people on Spotify has been pretty rudimentary. Really, the only way to do it was to subscribe to one of their playlists. The update allows you to follow artists, friends, and "influencers" much the way you would your friends, favorite writers, and musicians on Twitter. You can keep up with all of the different stuff your friends are listen to and get notifications when your favorite artists post new music. Beyond these big feature additions, Spotify is also adding a few more basic playback and organization features. There's a new collection tab which allows you to organize all of you music and things you add in a single place so that you don't have to add new things you want to keep close at hand to its own playlist. There's a new audio preview feature that allows you to quickly listen to a snippet of a song without completely interrupting your main listening session. Also, Ek brought out Spotify investor Sean Parker, and Lars Urlich from Metallica. Twelve years ago, Metallica sued Sean Parker for his exploits as the co-founder of Napster, so it's pretty freaking crazy to see them sitting next to each other on stage. The news? Parker and Metallica have kissed and made up, and Metallica will now be available on Spotify. https://www.youtube.com/watch?feature=player_embedded&v=jvy6LPCesOUThe whole point of trotting Urlich and Parker out for the money public relations shot, though, is to hammer home the idea that Spotify's on the side of musicians and artists. At the beginning of the presentation Ek let us all in on some figure. Spotify now has five million paying users and the company has paid out a half-billion dollars to rights holders. In other words, the idea is that Spotify really wants to be convince us all that it's good for the music industry—even if some artists complaining that Spotify barely pays artists a pittance.